My goal this month is to paddle 2-3 times per week. Took the kayak to work again yesterday and got to the docks and in the water by 4:45PM. I was out for a couple of hours. Even though it was sunny it was a little cool with some chop from a slight wind. I was glad I had my paddle jacket. It was very busy; lots of sailboats, dragon boats, and sculls. Kayaks seemed to be in the minority. Was too tired after a day at work to do more than 6 miles. That’s my minimum for any paddle for every day I’m out this month. This entry was posted on April 9, 2010 by DummyDiva. 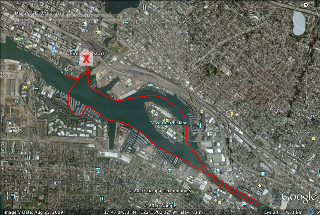 It was filed under Uncategorized and was tagged with Alameda Island, kayaking, training.